This new anthology from Tim Blake is quite a nice release. You get three CDs of music, some of which is previously unreleased along with a DVD of a French TV special. Blake is probably best known for his work in Gong and Hawkwind, but he's made quite a career on his own, too. This set includes some songs from Hawkwind, along with a couple tunes from Gong. There is one from act called "Saratoga Space Messengers," too. 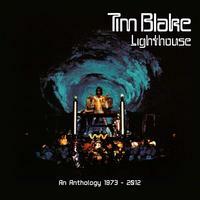 The rest of the music is all solo Tim Blake stuff. All the discs are encased in cardboard sleeves, and it has a nice booklet. The whole thing comes in a cardboard clamshell box. This is well worth having. I would say that the video, while interesting, is probably not something you'll watch a lot. It's essentially a lip-synched, a bit over-the-top production. It's cool, but definitely a product of its time and doesn't hold up that well with modern sensibilities. It should be noted that I've reviewed a number of these tracks on their original albums. For the sake of consistency, I've used those reviews here, in some cases with some minor changes. Trippy keys bring this into being and gradually weave the melodic and textural elements as it rises upward. In fact, this is a keyboard solo. A strange spoken voice begins this in a distant, echoey way. The piece moves forward as odder and odder musical elements are heard. A spoken male vocal eventually comes over the top. This is trippy space rock for certain. The cut shifts toward more mainstream space rock as a saxophone is heard over the top, but the keyboards are really the main driving element of this piece. More sung vocals are heard later, as almost a chant. This resembles some of the tribal side of Hawkwind in some ways, particularly as it drives more toward rock zones as it continues. The closing section with its Hare Krishna kind of lyrics brings an almost dreamy characteristic to this. I reviewed this track previously on its original album, but I think this version is an alternate mix, so I have written a fresh review of it. The keyboard elements here are rich and lush. This is very much along the lines of the kind of thing you might expect from Synergy. While it does have other instrumentation, the opening half or so of this is a keyboard solo. It gets into some powerhouse prog jamming later, though, that seems a cross between Hawkwind and Genesis. That section eventually gives way to some smoking guitar work. They bring it out into world inspired fusion jamming with plenty of space rock further down the road. This is a killer instrumental. This is a playful, weird kind of number. It has a lot of old school surf music in the mix, as you might guess from the title. It's tempered with trippy space rock and some seemingly tongue-in-cheek kitsch, too. Space keyboards open this in style. The cut grows with layer of sound stacking and dancing around one another. This is quite lush and very pretty. There is a definite enchanting quality to it. More killer keyboard sounds open this and move it forward in dramatic style. This is a fifteen and a half minute instrumental that feels a bit like a cross between Synergy and the electronic side of Hawkwind with some Tangerine Dream thrown in for extra points. Combining electronic textures not far removed from Synergy with something more like Hawkwind, this is energetic electronic space music. This instrumental is pretty amazing stuff, really. Atmospheric keys serve as the backdrop for some spoken elements. The cut works out from there with style. It works through purely instrumental after those first spoken bits until around the five minute mark. Then the real vocals join. The cut continues to evolve from that point. This is perhaps a bit like a cross between Blake's Crystal Machine period and his Magick one. It's more of a purely electronic tune. At over sixteen minutes in length, this is an epic piece. This is a live track from Hawkwind's Live '79 album. Given how many Hawkwind discs I own and have reviewed over the years, I was a little shocked to find that I haven't reviewed that disc previously. It might show up as a retro review down the road. The keyboards bring this in with echoey style. As it approaches the minute-and-a-half mark a droning kind of vibe heralds something new and dramatic about to begin. The cut evolves as it continues and spoken vocals come in over the top. Real vocals join after a time as the track develops more. The cut shifts to more of a full rocking movement around the four-and-a-half-minute mark as they jam forward. Psychedelic space keys begin this piece. It's a concise instrumental mood piece. This is a solid song featuring a haunting verse and catchy chorus based on military rhythm patterns. The kind of keyboard based sounds one expects by this point open the cut. It grows outward from there with some intriguing space rock jamming. This instrumental is rather fun. Coming in with an energy and a bit of that Synergy vibe, this is another cool cut. The vocals here lean on the high range. This is more of a rocking tune in a lot of ways. It's a bit more straightforward than some of the rest, too. There are some particularly pretty melodies built into this cut. The vocals are lower in register on this cut than they were on the previous one. This is a number that definitely shares a lot of territory with Blake's work in Hawkwind. It's a more mainstream cut, and quite an effective one, too. I really love the synthesizer sounds on the rocking movement that comes in later in the track. There are some cool progressive rock melodies that emerge further along the road. The vocals return after the extended instrumental movement. I love the cool groove of this rocking little number. It's an electronic tune in the vein of Synergy. It has some parts that are like sampled vocals, and this is more of an EDM piece. Space rock, EDM and symphonic electronic music all seem to merge on this compelling instrumental piece. It's lush and powerful. It has some particularly tasty sounds and moments. This is actually one of my favorites here. It even gets some soaring guitar sounds later in the piece, lending more of a Hawkwind vibe. I dig the cool keyboard textures that start this quite a bit. This does really feel a bit like floating. It gets into some cool space textures as it again combines Hawkwind with Synergy in a lot of ways. Another that starts with some trippy keyboards, some more rocking, almost guitar sounding, stuff rises up shortly after the begging to move things in a more energized direction. It's a really rocking, but still quite electronic piece. Tangerine Dream is a valid reference point in some ways. Starting a bit tentatively, this works out to some killer energized electronic sounds. I dig the piano work on this thing. There are hints of some of Rick Wright's Pink Floyd keyboard textures at points on this piece. Yet the comparisons to Synergy and Tangerine Dream are also appropriate. Call it what you like, though, this is a classy electronic number that works well. There is even some piano later in the track that seems to lean toward jazz. The cut gets into some rocking territory further down the road before shifting out to more space based keyboard jamming beyond that point. Sound effects and other trippy elements start this cut. It turns dark and spooky in a slow moving progression that feels like the soundtrack to a horror movie. From there this gets into really weird and experimental territory. This is without question the strangest and most experimental thing we've heard to this point. A lush keyboard wash opens this. The cut works out from there to a mellow psychedelic arrangement that doesn't feel far removed from Hawkwind music. Coming in spacey and trippy, this builds out like some kind of science fiction soundtrack. It makes me feel like I'm sitting in a 1950s film. 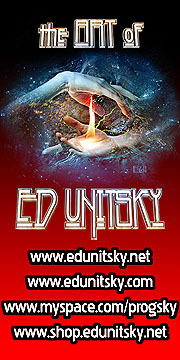 More melodic elements gradually rise up, bringing some pretty and dramatic prog textures. This piece is over 20-minutes long, so there is plenty of space to develop things in the long haul. By the time it approaches the seven-minute mark the cut has become these overlapping waves of keyboard lines that echo across each other. There are some new intriguing tapestries of keys that emerge further down the road carrying the piece forward. More melodic and mellow sounds take control as this continues. That movement eventually ends it. Coming in trippy, there are non-lyrical, tribal sort of vocals that come across. This takes on a psychedelic space vibe as it works forward. There are definite hints of Hawkwind, but the stranger side of Hawkwind here. This gets into some pretty intriguing and spacey territory as it carries forward. I love some of the melodies that emerge on this thing. It takes on some world music textures at times. There is a weird, but cool, warped texture to this cut. It's a bit like Synergy on acid. I don't know if that warped sound is a function of the tapes or intentional, but it really does lend an other worldly vibe to this thing. Synergy is on the menu here, too. The number works quite well. It's one of my favorites on this second disc. This live recording is so tasty. it has a lot of Hawkwind type concept is heard on some of this. The cut is more mainstream progressive rock, too. I'm really glad to have this recording because it's very cool. It really soars when it starts rocking more further down the road. The number has some seriously powerhouse instrumental work as it continues.